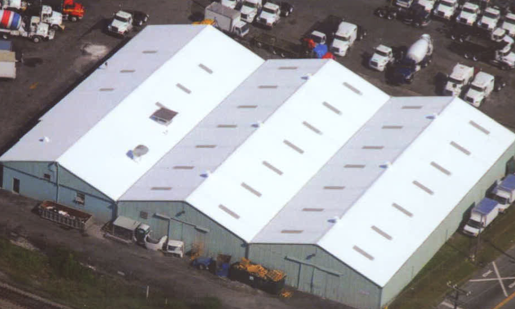 Metal Roof Restoration — Coatings Application & Waterproofing Co.
One system consists of recrimping any loose seams, caulking all vertical seams and installing two coasts of Acrylithane over all metal surfaces. The product was the JONES-BLAIR Industrial Division, ACRYLITHANE, a high performance, two component coating for use where appearance, durability, color and gloss retention and corrosion resistance are paramount. A second system consists of power washing all metal surfaces followed by treating all seams, fasteners, joints, skylights and penetrations to prevent them from leaking. The entire roof and flashings will then receive two coats of Acrylic, Urethane or Silicone coating to compliment the architectural integrity of the building. The entire system is backed by a 10 year guarantee. Many colors are available in addition to White which is chosen for added reflectivity of the surface.